While crewing aboard Lois McClure for her four-month Erie Canal tour, I heard about a wonderful opportunity. While the boat was in Rochester at the World Canals Conference, I spoke to Wendy Marble, one of the tugboat captains of the NYS Canal Corporation. She mentioned that she knew of a ship, the Gazela, that was going on a trip in October, and that they were looking for volunteer crew. I gave her my email address and hoped for the best. About a week from the end of the Erie tour, I got an email from the Philadelphia Ship Preservation Guild (the organization that runs the Gazela), and a short flurry of emails later, I was slated to join them in Philadelphia the day after the Lois returned home. After only 18 hours at home (a few quick loads of laundry and a repack of essential gear), I was on the road to Philadelphia. A bit of an overview of the Gazela – built in 1901 in Portugal, as a commercial cod fishing vessel, she had 68 years of almost continual use. Her last voyage was in 1969, when she returned with only half her hold full. That was the nail in her coffin, and she was decommissioned after that. She was bought in 1971 by a wealthy American philanthropist, William Wikoff Smith, for the Philadelphia Maritime Museum. In 1985, she was transferred to the Philadelphia Ship Preservation Guild, who now maintains and operates her. She is 177’ overall, 130’ on the waterline. Her masts stand 94’ from the deck, and she draws about 17’. Her weight is currently approximately 650 tons. Coming into Philadelphia, I was expecting the Gazela to be easy to find. With the masts over 100 feet off the water, how tough could it be to find such a ship? Surprisingly, there were bigger ones there – the Moshulu, a 4 masted steel hulled barque designed to carry cargo around Cape Horn, was on the waterfront, as well as a steel hulled Spanish American War flagship, the USS Olympia. Both of these vessels have rather tall masts (the Moshulu especially!). The Gazela seemed rather dwarfed by them. This trip was from Philadelphia out to Oyster Bay, Long Island, for the big oyster festival there. I was going to be on board for the full round trip – 10 days. It was my first time out on the ocean in anything other than a small sailboat, and I was super excited for it. Standing on board the ship was an amazing feeling. The trip to Oyster Bay was pretty uneventful. It was fairly choppy and windy the first day, though we stayed about 8 miles off shore. We could still see the lights of the cities we passed. Feeling the ship porpoising about was interesting. I was a little nervous at first, being used to the total stability of the Lois, but I kept reminding myself that the ship was designed for this, and soon began to enjoy it. The second day of travel, we came into New York Harbor. As we entered, one of the experienced crew members took me and another newer volunteer up the foremast. We went all the way to the top, and entered New York City standing in the rigging. It was an experience I’ll remember for a very long time. Due to the wind, we were not able to sail for the first few days of the trip. We made it all the way to Oyster Bay before the wind started to switch around a bit. Thankfully, we were a day early, and so we headed past Oyster Bay, and at about 8 in the evening, set sail for the first time. Sail setting in the dark is a really tough thing when you don’t know where any of the lines are. We sailed through the night, and coming up on watch first thing in the morning to see the sails glowing in the sun was another sight that will stay with me for a long time. 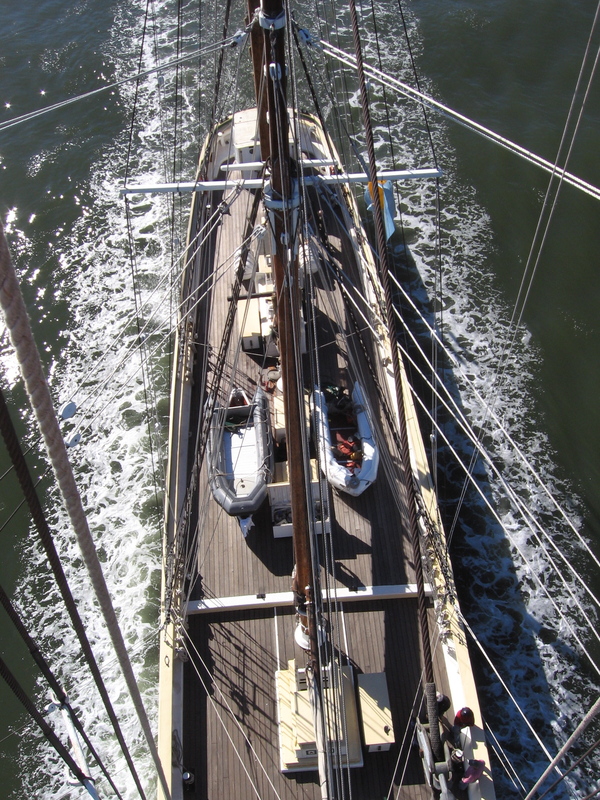 We sailed all of Thursday, slowing down through out the day to make sure we hit the right tide to come into Oyster Bay. It was a really cool feeling to be on a sailing ship on the ocean. We came into Oyster Bay on Thursday evening. In preparation for high winds and the storm that was slated to come through, all lines were doubled, and the bow and stern lines were tripled. The ship wasn’t going to go anywhere. Friday was spent tidying the ship up and getting it ready for the festival on Saturday and Sunday. Those two days saw 6500 people over the deck of the ship. It was a madhouse. The trip back saw a lot of the crew rotate. 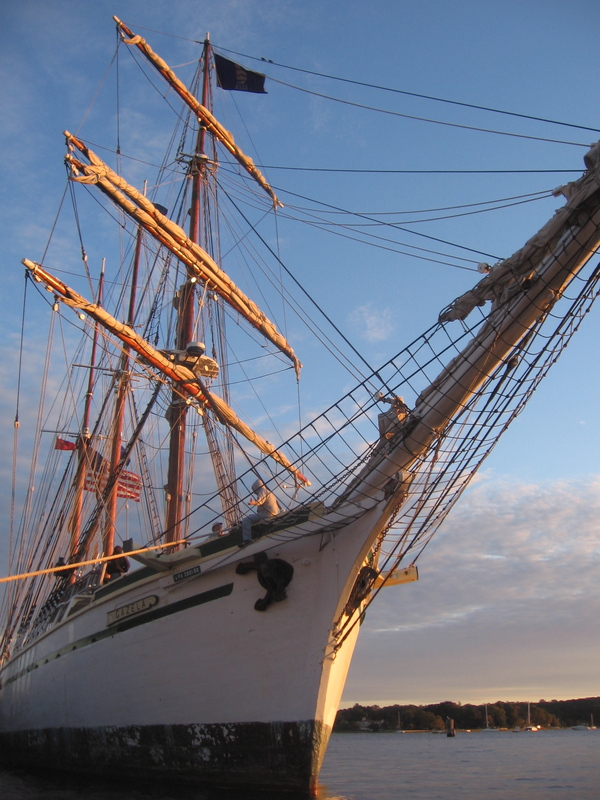 The Philadelphia Ship Preservation Guild is a volunteer organization, and so the members use their vacation time to be able to work on the ship and go on the voyages. Many of them cannot take more than a handful of days off at a time. Having the crew switch up was nice, as it helped me go over the practices on the Gazela that were different than those we do on the Lois. The trip home saw us sailing most of the way. The captain checked before we left about scheduling and decided to go ahead and just meander our way back to Philadelphia. The wind was pretty finicky, and so we spent a lot of time shifting sails around (tacking and jibing/wearing). After two days of barely making steerage, the captain decided to motorsail the rest of the way, and we ended up actually sailing for a bit coming up the Delaware River back to Philadelphia. This was a fantastic experience for me, and I want to thank all those who made it possible: Wendy Marble, for that first contact; Patrick Flynn, for actually letting me come on board; Erick Tichonuk and Art Cohn, for letting me go; and the crew of Gazela, for making it a wonderful learning experience. I hope to be back again.